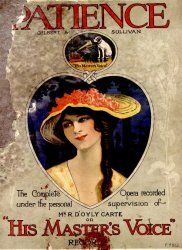 This recording was the fifth in a series that HMV recorded with D'Oyly Carte co-operation, beginning in 1917 with the The Mikado. ter the first two recordings of the series, HMV auditioned several D'Oyly Carte artists and found that only one, Derek Oldham, had a voice suitable for the gramophone. Oldham was therefore included in the third and fourth recordings of the series, while all the other roles were cast from HMV's own stable of singers. Patience however, was not an opera Oldham ever performed with D'Oyly Carte, so HMV simply reverted to the policy of using their own soloists exclusively (the last time they would do so). Rupert D'Oyly Carte's involvement was not purely nominal. He had veto authority over individual "takes," and even singers. 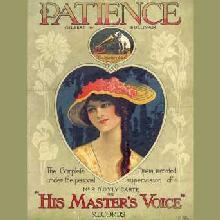 ter most of the opera was recorded, in January of 1921, Carte found many of the sides objectionable, leading to two more extensive recording sessions in June. Among Carte's objections was Robert Radford's Grosvenor, so he was replaced with Frederick Ranalow, and all sides that included Radford were re-done. Ranalow is a rather poor Grosvenor, so one scarcely imagines what Radford's must have been like. Carte evidently did not care for Peter Dawson's Colonel either, but HMV was able to persuate him to allow Dawson's performance to stand. To be sure, his Colonel lacks the patina of traditional D'Oyly Carte basses, but Dawson was one of the more popular recording artists of the day, and there is much virtuosity to admire in his reading of the part. Edna Thornton is a sumptuous Lady Jane, arguably the best on record (despite never having played the role on stage). The other ladies are less appealing. Violet Essex has something of a cult following, but I find her Patience a bit forced, particularly in Act I. Nellie Walker's Angela is undistinguished. 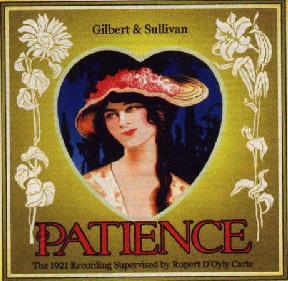 Two D'Oyly Carte tenors, Harold Wilde and Walter Glynne, sang in the chorus. However, Francis does not mention these, saying only that, on side 14, the chorus was Essex, Jones, Baselow, Walker, Thornton, and Heyl. On the flyle of Peter Parker's set, Wilde, Glynne, Ruby Heyl and Edward Halland are credited with "short solos." But, on the record labels, the only side crediting Heyl is s. 14, which has no female solos. Wilde and Glynne are not credited on any side. Halland is credited on s. 17 ("If Saphir I choose to marry"). This side was likely a re-do. Presumably, Peter Dawson was unavailable, and Halland sang the Colonel's one line in that song. In summary, this recording will not be anyone's first-choice Patience. There are a number of appealing sides, but the quality of the performances varies widely. It is of considerable historical interest, but most listeners will look elsewhere for a performance of more uniform delight. Overture — There is a cut in the middle section from 16 ter B to 14 ter D inclusive. This makes an easy join from bars B15 to D15. Nos 9 and 10 ("When I go out of door" and "I'm a Waterloo House young man") are made into one item by joining the penultimate bar of the duet to bar 20 of the reprise, thus omitting the final chords of the duet and the opening 19 bars of the reprise. Michael Walters pointed out that #2a, #4a, and #8a in Act I, and #1 in Act II, were not present in the older Chappell scores that would have been in use at the time of this recording. The bar at D1 of the Act I finale is also absent in older scores. Chris Webster has prepared a digital transfer to CD, using modern technlology to eliminate much of the background crackle and hiss present on even the best surviving copies of the original discs. This recording was never before issued on LP or CD, so there are no other efforts to compare it with. However, Webster's transfer certainly improves on the 1970s Pearl LP re-issues of several other acoustical recordings. The voices have an immediacy that one would search for in vain in the original pressings. Just to bring that point home, Webster includes a brief bonus track at the end, with a bit of the original recording unenhanced. The CD also comes with Michael Walters's encyclopedic liner notes. Anyone interested in historical recordings will find this transfer indispensable. The table above provides details of the sides in continuity order. The information is derived from the researches of Michael Walters, Chris Webster, Peter Parker, Brian Rust, and John Francis, for which I am most grateful. Names of artists singing on each side were provided by Peter Parker from the record labels, supplemented by Brian Rust's research in the HMV archives. Not all sides list Byng as conductor, but it is assumed that he in fact conducted all of them. The recitative "Am I alone and unobserved" is presented on side 6, but the song "If you're anxious for to shine" is on side 7. The orchestra tops off the recitative with two chords that Sullivan never wrote, so that side 6 will end in a cadence. The song itself begins in the usual manner. On sides 12, 13 and 15, the Francis Discography lists only one published take, but Michael Walters, Chris Webster, and Peter Parker have between them verified all of those listed. Sides 4, 8, and 14 were included on Arabesque's LP reissue of the 1931 Ruddigore. The table above lists the order in which the sides were recorded. Where there were multiple attempts at a side on the same day, none of which are known to have been issued, the entire row is shown in italics, and the word "Rejected" appears in the "Result" column. Where there were multiple attempts at a side on the same day, at least one of which was issued, the word "Issued" and the side number appear in the "Result" column. For takes not known to have been issued, the matrix number is shown in italics. "Unknown" takes highlight gaps in matrix numbers (which were normally assigned sequentially). Brian Rust's notes, although ambiguous at times, imply that Ho4710-1 and Ho4710-2 ("I hear the soft note") were issued. My colleagues and I consider this highly unlikely, so we list them here as rejected takes. Francis says that the overture was recorded on 28 January. Since the matrix number is sequential, we are required to believe that HMV made no recordings on 27 January, and that the orchestra was re-assembled on the 28th to record just one side. This is certainly possible, but Francis could also be mistaken. Robert Radford was originally cast as Grosvenor, but Rupert D'Oyly Carte was dissatisfied with him. He was replaced with Frederic Ranalow, and some sides were redone. Brian Rust's Violet Essex discography credits Ranalow on rejected matrix Ho4723, but clearly Ranalow hadn't been engaged yet: Radford must have sung on that side. Matrix Ho4724 was also likely a Radford side. Some or all of the matrices from Ho4715–Ho4721 could have been Patience items that were redone on 9/10 June. Indeed, all of the items recorded on 9–10 June could have been re-takes.